In 1692, a young French aristocrat visiting King Louis XIV’s royal court was asked if he knew how to dance. The aristocrat, who went by Montbron, replied with characteristic overconfidence, gloating enough to attract the attention of other courtiers. Rookie mistake. It wasn’t long before the room of nobles asked him to prove it. It was a truth universally acknowledged that a man pining for a political career in 17th century France needed a dance teacher. The ability to dance was both a social nicety and a political necessity, the birthmark of an aristocratic upbringing. “Good breeding demands that pleasing and easy manner which can only be gained by dancing,” the famed dance teacher Pierre Rameau wrote in 1725. Dancing badly in court wasn’t just humiliating, it was also a potential career killer—and Montbron was all talk and no game. The aristocrat took to the floor and immediately lost his balance. The audience doubled in laughter. Embarrassed, he tried deflecting attention from his legs with “affected attitudes,” waving his arms and making faces. The move backfired. Everyone laughed louder—including the most important man in the room, King Louis XIV. “There were reportedly more than two hundred dancing schools in Paris in the 1660s, all devoted to training young noblemen to avoid similar dread breaches of etiquette,” writes Jennifer Homans in Apollo’s Angels: A History of Ballet. The young aristocrat didn’t show his face in court for a long time after his grand flop. 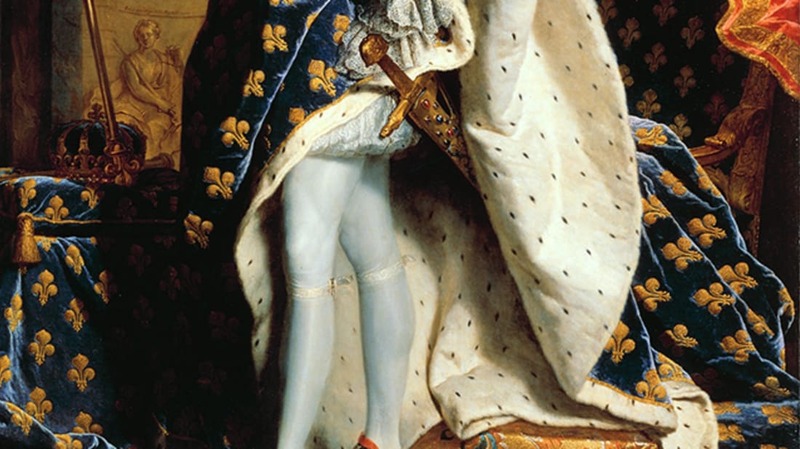 King Louis XIV, a lifelong ballet dancer, would have it no other way. To him, ballet was more than an art. It was the political currency that kept his country together. When Louis XIV was 10, he was chased out of France by a band of angry aristocrats who wanted to keep royal powers in check. He had sat atop the throne for four years, but the country was run by adult advisors. The vacuum of power was a symptom of a series of aristocratic uprisings called Frondes. At first, the rebels of the Fronde didn’t want to overthrow the government; they simply wanted to avoid absolute rule by royals. The government had raised taxes to recover funds from the Thirty Years’ War, and the nobility was opposed to the increase. But when civil war erupted, some factions tried taking control of the crown. By the time the young king returned in 1652 at age 14, his worldview had changed. He returned to Paris forever skeptical of his underlings. Louis did everything in his power to elevate his status. He practiced fencing and vaulting, and trained for hours daily with his personal dancing master, Pierre Beauchamp. It was more than mere exercise: According to the period’s political theory, the state of France was literally embodied by its ruler. Sculpting his muscles and ensuring that his body was perfectly developed and proportioned was a way to demonstrate he was the ultimate source of power, ruling by divine right. To ensure that the aristocracy didn’t rise up and attempt to seize power from him again, Louis kept the patricians at Versailles within his sights—and perpetually busy. He turned Versailles into a gilded prison, calling in nobles from their far-away estates and forcing them to stay at court, where he could keep a close eye on them. Louis XIV’s theory was that nobles couldn’t overthrow the government if they were too busy attending to trifling matters of etiquette. If nobles spent all of their energy trying to maintain their status, they wouldn’t have time or ability to rise up against the monarchy. And dance was one of the many ways Louis was able to keep the nobility in their place. Dance had been intricately bound up with court etiquette for decades. But under Louis’s watch, it became one of the most important social functions of the court. Nobles learned about two to four new ballroom dances a year, performing the social dances before dinner. “At Louis’s court, a courtier probably had to keep some twelve dances at the ready, a considerable feat of memory in view of their diversity and complexity,” writes Wendy Hilton in Dance and Music of Court and Theater. Louis XIV’s stage debut at age 15, Le Ballet de la Nuit, was a perfect example of the power games he would come to play. The performance, which consisted of 43 mini-ballets, lasted 12 hours and stretched overnight into dawn, with an elaborate set including chariots crossing the skies, winged horses dipping in and out of clouds, and monsters arising from waves. At the end of the performance, the Sun (played by Louis, encrusted in jewels and topped with ostrich feathers) comes to vanquish the Night. Louis would repeat the performance six more times over one month. As Louis grew older, he staged elaborate, lengthy ballets—called ballets de cour—as masculine displays of athleticism and virility. (Women weren’t allowed to dance; feminine roles were usually performed by cross-dressing men.) The king, of course, danced the lead roles dressed in intricate costumes, gilded with expensive jewels. His favorite getup? Roman emperor. It was a far cry from royal dances of the past. When ballet first emerged in Italy in the 15th century, it resembled a staged display of slow, elegant walking. Catherine de Medici brought the artform to France when she married King Henri II in 1533, but Louis XIV pushed the craft to become highly technical and distinctively French. The ballets de cour were an extension of everyday court etiquette, all designed to keep the aristocracy perpetually nervous and literally on their toes. Pushing ballet forward was more than a power move at home—it was a way to show the rest of Europe that France was the center of high culture. Louis wanted world leaders to admire France’s artistic achievements as much as they admired the country’s military might. And it worked. Royal French fashion, etiquette, and taste became extremely popular in the courts of other countries. The king of Sweden even sent an ambassador to France just to observe artistic developments and report back. Thanks to his enormous appetite, Louis XIV’s dancing career didn’t last. His sister-in-law, the Princess Palatine, wrote of a meal in which the king wolfed down “four bowls of different soups, a pheasant, a partridge, a large bowl of salad, two slices of ham, a slice of mutton and a dish of pastries, finished with fruit and boiled eggs.” According to a ballet myth, when the overweight king couldn’t execute the complicated entrechat-quatre jump—a move that requires a dancer to leap and beat his legs twice before landing—his dancing master invented a one-and-a-half beat jump as a cheat. Today, the jump is called the royale. In 1701, Louis stood for a new royal portrait. The painter, Hyacinthe Rigaud, had a talent for rendering faces in exact, photographic detail—a skill that had previously caught the eye of various aristocrats. In fact, Rigaud was so popular among aristocrats that he often didn’t have the time to finish most of his paintings. Like a 17th century James Patterson, he had to hire a stable of aides. Fueled by hot chocolate and gimblette cookies, they were in charge of filling in background details. Over the years, Rigaud had practically cataloged all the French nobility, and his work won praise because it depicted nobles as they wanted to be seen: grandiose, powerful, and wealthy. Louis, who was still determined to elevate his status, knew that Rigaud was the perfect portraitist for the job. There’s a lot to giggle about in Rigaud’s final product: the French king’s disdainful expression, the glam-metal hair, his arm perched saucily on his hip, the heeled shoes, with jeweled buckles to boot! But, to Louis, the painting commanded respect. When Rigaud painted his subject, the 63-year-old King was a stout 5 feet, 4 inches. Rigaud portrayed him in a flattering light, tweaking the perspective so the viewer gazed up at the King, creating the appearance of a taller man—an effect heightened by mounting the portrait on a wall. Louis’s chunky dancing heels added a few inches of height, while coronation robes and ermine fur concealed his large body. With the exception of his legs. Louis was proud of his legs. Sculpted from years of ballet, they were signs of a cultured and athletic past, and while Louis had relinquished his danseur star status decades earlier, he never let his courtiers forget the power dance held in his government. Rigaud’s portrait was an intimidating display of the king’s strength and wealth, and whenever Louis was away from court, nobles were forbidden from turning their backs to the painting. By that point, showing off his gams was the king’s way of showing off his legacy as a trailblazer. By the time Louis hung his portrait on the wall, he’d created the Royal Academy of Dance, precursor to the prestigious Paris Opera, been instrumental in codifying the five main foot positions used in ballet today, and helped make French the art form’s official language (consider terms like pirouette and plié). Were it not for Louis XIV, ballet might forever have remained a social dinner dance for bored Italian aristocrats. If he were still alive, Louis would be appalled by the modern stereotypes of ballet as dainty. Nothing could be further from the truth: Ballet was a powerful political tool, a means of maintaining a country’s stability and keeping the status quo. It’s a stark reminder of how much the power games of politics have changed. While modern politicians polish their reputations with slick social media managers and a pinch of pandering, Louis did it with art. Maybe it’s time for us to bring that tactic back. Can you imagine two opposing members of Congress debating the merits of immigration policy while performing a pas de deux in silken white tights?